It's powered by a liquid cooled 799cc parallel twin engine, producing 103.3bhp at 9,000rpm and maximum torque at 8,000rpm. It's actually KTM's first parallel twin engine, compared to the single in the 690 Duke and they call it the LC8c with the little "c" standing for compact, achieved by using a parallel twin over a V-Twin and it's a stressed member of the frame. There's also an L version available with 94bhp or 47bhp restricted for the A2 licence. KTM's track mode gives you launch control and the ability to turn off the anti-wheelie control while the Supermoto mode allows you to block the rear wheel for slides while with the ABS continues to work on the front. The 10-spoke cast alloy 17" wheels take a 170/20 Maxxis Supermaxx ST tyre at the front and 180/55 at the rear. Accessories include the Akrapovic slip-on muffler (£752), wavy discs (£383), triple clamp (£493), pillion seat cover (£108), 20mm lower seat, heated grips, USB socket (£41), Carbon Fibre front mudguard (£166), racing graphics (£83, check the pics), front spoiler (£66), 780mm lowering kit and a variety of bags. 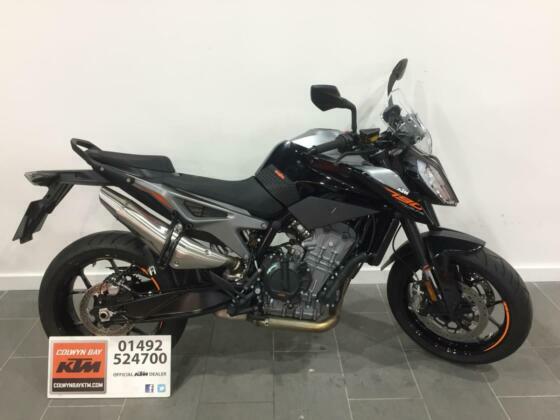 2019: KTM launched the 790 Adventure and 790 Adventure R with a de-tuned engine, longer travel suspension, beefier suspension/brakes and larger fuel tank.